Barbara Techel’s New Book, Through Frankie’s Eyes, gives Joyful Pause! Please join us in welcoming award-winning author and advocate for dogs with IVDD (disc disease) and dogs in wheelchairs, Barbara Techel. Here Barbara shares her poignant journey that lead to what she calls her, “authentic self,” with the help of a little dog named Frankie. 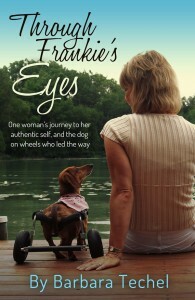 I thoroughly enjoyed reading Barbara’s new book, Through Frankie’s Eyes: One woman’s journey to her authentic self, and the dog on wheels who led the way. Although companion animals are at the core of this story, you don’t necessarily have to be an animal lover to appreciate the book’s message. However, you will most likely come to love and value them after reading Barbara’s story. Barbara is currently enjoying a walk in the “blog park,” to promote Through Frankie’s Eyes and answered some questions for the National Dog Week Blog. Please scroll down to find a list of Barbara’s books and Links. This year’s theme for National Dog Week is K-9s and Kids: Celebrating the Bond between Youth and Dogs. As you have written on this topic, can you share any experiences you have had that exemplify this theme? Kids and dogs are just such a beautiful combination! And yes, I can speak to this having had done 400 school and library appearances with Frankie, my little dachshund who was in a dog wheelchair. While all dogs have wonderful lessons to offer kids in so many ways, the fact Frankie was in a wheelchair added a special facet to it. One story that I’ve told oodles of times and which is also in my new adult nonfiction book Through Frankie’s Eyes is about a little boy named Jackson who has a form of Cerebral Palsy. His mom had happened upon my children’s book Frankie the Walk ‘N Roll Dog and bought it hoping it would help her then three-year-old son. We were able to meet Jackson a few weeks later as I happened to be traveling with Frankie to the state of Illinois where he and his family live. To this day he still talks about Frankie. They have a very special bond. Visiting schools with Frankie was always so special too. Kids loved seeing that a dog can be happy in a wheelchair. They accepted her as she was. Frankie taught many kids to be positive, be brave, and to be happy no matter what their obstacles. I have a huge box of notes and pictures that children have sent me over the years telling me how much they love Frankie and what they learned from her. I’m hoping my new little love dog on wheels, Joie, will follow in Frankie’s paw prints and tire tracks and enjoy doing some school visits to carry on Frankie’s legacy of helping kids be positive despite challenges they face. We are scheduled to present at a school on May 10th so this will be the big test! Tell us a little about National Walk and Roll Dog Day, which occurs the first day of National Dog Week this Year! I love that National Dog Week begins on the day of National Walk ‘N Roll Dog Day (NWNRDD)! It does not get any better than that, now does it? NWNRDD honors and celebrates dogs in wheelchairs who teach us to embrace each day with love, hope, and joy. I founded it in August 2012. I came up with the idea in April 2012, as I knew Frankie and I were in transition. She was getting older and beginning to slow down. I set a date to fully retire her from her work in June 2012. For six months prior she was semi-retired and doing limited appearances. But I wanted to be able to carry on her mission that dogs in wheelchairs can live a long, happy, quality life when the day came she would no longer be here. At the time I was taking a course on building my author platform. I loved the class because it was all about being authentic and leaving a legacy. I was struggling through the course because I knew my work with Frankie, as I knew it, was ending. It was a hard place for me to be because I truly enjoyed everything we were able to accomplish and do together. During one of the sessions the idea of this day came to me. It helped ease my mind. Though I had planned to begin the day while she was still living, that was not meant to be, as she passed away one week after I retired her. When her fans heard of her passing I had an outpouring of love and support–so many wanted to honor her and her work. So I first established the Frankie Wheelchair Fund. This fund helps dogs who need wheelchairs that are either from a family that is in financial stress or dogs in rescue. 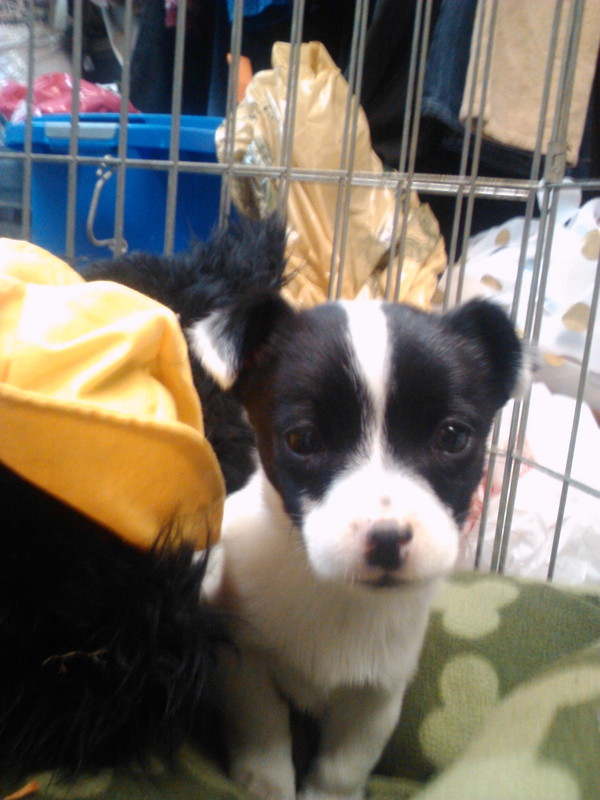 To date the fund has helped fourteen small dogs get a wheelchair. The Frankie Wheelchair Fund and NWNRDD were a natural fit, so I officially announced NWNRDD in August of 2012. The day is celebrated every September 22. 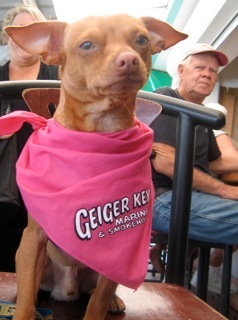 Our first celebration last year had LoveyLoaves Special Needs Animal Sanctuary in Florida and a Veterinary clinic in Puerto Rico embracing the day and celebrating in their own locations with special events. Can you share some of the events that have celebrated this day or plans for this September? Our first year in bringing awareness to NWNRDD and the Frankie Wheelchair Fund, I had special t-shirts created that I sold through our website so people could wear them in honor and help spread the word on September 22… as well as all year long when they wear their special NWNRDD t-shirts! I also ran a photo contest and had people enter their dogs who were either in a dog wheelchair, or supported NWNRDD. Each dog had to pose with a special sign I had made and they could print from their computer. A winner was chosen at random, as it was too hard to pick just one cute photo! A prize was given to the winner donated by LoveyLoaves and myself. You can see everyone who entered on our special Pinterest board. This year I’m still in the thinking stage and giving thought to ideas in which we can celebrate the day. But I do welcome any veterinarian clinic, rescue, dog organization, etc. to jump on board and help spread the word in their own unique way on September 22, which was my hope when I established this special day. Anyone interested can follow along on our Facebook page for updates, as well as some adorable and fun dogs in wheelchair photos that I love to share. And if you have a dog in a wheelchair, by all means, please post on our wall as we would love to see them! Become a fan on Facebook of National Walk ‘N Roll Dog Day & help us honor and celebrate all dogs in wheelchairs and the lessons of love, hope and joy they teach us. A portion of all my book sales goes to the Frankie Wheelchair Fund. I would like to thank Project Pets, Spay, Neuter, Love for naming one of their Rescue Pups after my late dog Hooper. In late February I read the story about a box of puppies that had been abandoned in a parking lot in North Carolina. The pups were in need of veterinary care before they could be placed in good homes. Project Pets was allowing anyone who made a donation to the care of these pups to have the chance to name one of them. With National Dog Week celebrated the week of September 22nd, we are just six months away from that very special time that was designated to honor the nation’s dogs in a collective and organized manner. If we all think hard enough, I am sure that each town, county or state of the union can think of just one way we can improve the welfare of our Companion Animals and the nation’s youth in even just a small way. This September let’s count the ways kids go to the dogs, and the dogs in turn, go to the kids! 1. Early this year, Bocker the Labradoodle, helped to comfort the children of Newtown, Ct, in the aftermath of the elementary school tragedy. 2. Sean Poser, of Kids Adopt A Shelter (KAAS) has continued to motivate young people across the nation to collect supplies for local shelters. 3. Author Barbara Techel of Joyful Paws teaches young people to appreciate the gifts and lessons offered by animals and humans facing special challenges through her writing and the establishment of “Walk and Roll Day,” (which falls on the first day of NDW this year)! 4. Audrey Hendler of A Fair Shake for Youth Harnessing the therapeutic power of therapy dogs to help at-risk youth develop skills and behaviors that will give them a fair shake at a better life. 5. Dogs are trained in lifesaving skills in which they are able alert young people to the onset of seizures and the detection of materials to which children are highly allergic. 6. Nikki Moustaki teaches scout and school groups on how to make cards with her Pet Postcard Project that helps to feed shelter dogs across the nation. 7. 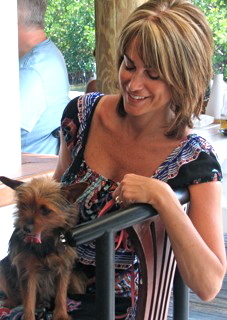 Teresa Lewin, and her work with the organization, Doggone Safe, educates children on how to avoid hostile encounters with dogs and to avoid dog bites. 8. Public libraries across America continue to welcome Certified and trained dogs for programs like “Read Aloud to the Dogs,” which allow young children to read to patient dogs without fear of judgement. 9. Dog make great writing prompts for literacy projects. In the 1930s the Humane Society sponsored essay contests for students who wrote about what National Dog Week meant to them. The photo of the contest winner appeared with the winning essay in the New York Times. We think this is a good start, but we would love to hear what you have planned!